If you have been injured in a car or motorcycle accident in Missouri, you may chalk it up to the ordinary hazards of driving. After a quick trip to the emergency room to stitch the cut on your head, you call your insurance agent and let them settle the case. Within days, though, you start to have memory loss and you start developing headaches. You go to your doctor, and she recommends that you get an MRI. The tests reveal that there is closed head injury, and your headaches and memory loss may be a symptom of permanent brain injury. Suddenly, the ordinary car accident threatens your career with permanent disability, and your insurance company’s claims adjuster holds your fate in his hands. Don’t settle for the insurance company’s offer, contact the attorneys at M. Blake Heath, Trial Attorney LLC who can help you get fair compensation for your injuries. At M. Blake Heath, Trial Attorney LLC, we are experienced in handling personal injury cases resulting from motor vehicle accidents of all types—whether it is a motorcycle, boating, or car accident. We know the key is thorough and timely investigation. After a crash, the faster we can send out an accident reconstructionist and investigator to document evidence and evaluate the scene, the better. We will exhaust all avenues of recovery, including highway defects, product liability and other third party claims. In the event of a fatal wreck, we can also pursue a wrongful death claim on behalf of the family of the deceased. Our attorneys have a long list of awards and citations from their peers to compliment their impressive record of verdicts and settlements. M. Blake Heath, Trial Attorney LLC is proud to offer every Kansas City client the personal service and responsiveness only a small firm can provide, while giving them the experience and resources necessary to maximize their award. We are a personal injury firm, and represent people who have been injured in semi truck accident, sustained catastrophic injuries, or have experienced insurance bad faith, among others. If you or a loved one has been injured in a car or motorcycle accident on a Missouri road, contact the experienced personal injury attorneys at M. Blake Heath, Trial Attorney LLC for a free case evaluation. 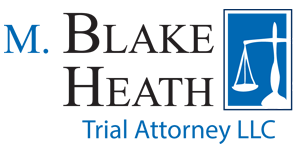 At M. Blake Heath, Trial Attorney LLC, we represent the victims of personal injury in the Kansas City, Missouri metro area, and the counties of Jackson, Clay, Platte, Cass, Buchanan, and Johnson—including the cities of Independence, Lees Summit, Gladstone, Raytown, Blue Springs, Liberty, Grandview, St. Joseph, Platte City, Warrensburg.